Name Variation Alvin T. Layton was also known as Al. 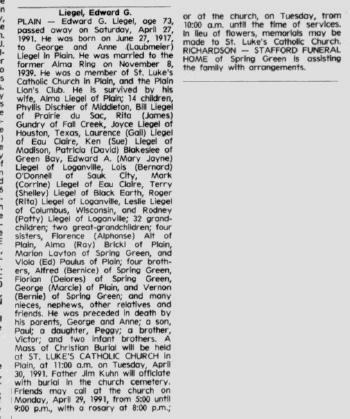 Alvin T. Layton married Marian M. Liegel, daughter of George F. Liegel and Anne M. Laubmeier. Alvin T. Layton was born in 1921. Joseph Liegel was the son of George F. Liegel and Anne M. Laubmeier. Joseph Liegel died in 1935. Ralph Liegel was born before September 1926. He was the son of George F. Liegel and Anne M. Laubmeier. Ralph Liegel died on 23 September 1926. Name Variation Edward G. Liegel was also known as Ed. Edward G. Liegel was born on 27 June 1917 at Plain, Sauk, Wisconsin. Edward G. Liegel married Alma Ring, daughter of William Ring and Margaret Nachreiner, on 8 November 1939. 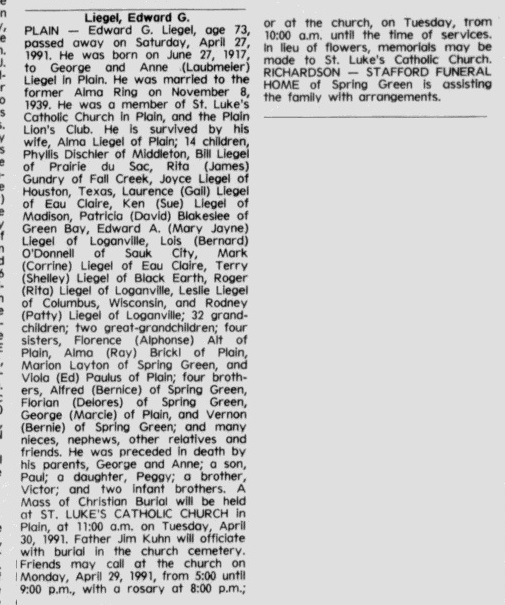 Edward G. Liegel died on 27 April 1991 at age 73 Edward G Liegel obituary. Edward G. Liegel obtained US Social Security Card at Wisconsin; last residence not specified. [S250] U.S. Federal Census 1930 U.S. Federal Census, by Ancestry.com, Year: 1930; Census Place: Franklin, Sauk, Wisconsin; Roll 2609; Page: 11A; Enumeration District: 13; Image: 129.0. Name Variation Victor P. Liegel was also known as Vic. Victor P. Liegel was born in 1925 at Wisconsin. Victor P. Liegel died in 1972. George Liegel was born on 13 May 1858 at Wisconsin. He was the son of John Baptist Liegel and Barbara Schwartz. George Liegel married Ursula Heiser, daughter of Henry Heiser and Margaret Obrecht, on 9 February 1881. George Liegel died on 25 February 1935 at age 76. [S248] U.S. Federal Census 1860 U.S. Federal Census, by Ancestry.com, Year: 1860; Census Place: Franklin, Sauk, Wisconsin; Roll M653_1429; Page: 580; Image: 146; Family History Library Film: 805429. [S247] U.S. Federal Census 1870 U.S. Federal Census, by Ancestry.com, Year: 1870; Census Place: Franklin, Sauk, Wisconsin; Roll M593_1739; Page: 81B; Image: 168; Family History Library Film: 553238. [S245] U.S. Federal Census 1900 U.S. Federal Census, by Ancestry.com, Year: 1900; Census Place: Franklin, Sauk, Wisconsin; Roll T623_ 1816; Page: 2B; Enumeration District: 134. Name Variation Ursula Heiser was also known as Amelia Ursula. Name Variation Ursula Heiser was also known as Julia. Married Name 9 February 1881 As of 9 February 1881,her married name was Liegel. Ursula Heiser was born in March 1858 at Wisconsin. She was the daughter of Henry Heiser and Margaret Obrecht. Ursula Heiser married George Liegel, son of John Baptist Liegel and Barbara Schwartz, on 9 February 1881. Ursula Heiser died in 1935. Ursula Heiser had 8 with 8 living in 1900 children. [S248] U.S. Federal Census 1860 U.S. Federal Census, by Ancestry.com, Year: 1860; Census Place: Franklin, Sauk, Wisconsin; Roll M653_1429; Page: 577; Image: 143; Family History Library Film: 805429. [S247] U.S. Federal Census 1870 U.S. Federal Census, by Ancestry.com, Year: 1870; Census Place: Franklin, Sauk, Wisconsin; Roll M593_1739; Page: 86B; Image: 178; Family History Library Film: 553238. Name Variation John H. Liegel was also known as Johnie. John H. Liegel was born in February 1882 at Wisconsin also reported as Feb 1883. He was the son of George Liegel and Ursula Heiser. John H. Liegel married Elizabeth Volk, daughter of Joseph Volk Sr. and Theresa Kirshbaum, on 10 April 1907. John H. Liegel died in 1944. [S244] U.S. Federal Census 1910 U.S. Federal Census, by Ancestry.com, Year: 1910; Census Place: Franklin, Sauk, Wisconsin; Roll: T624_1736; Page: 7B; Enumeration District: 0115; Image: 896; FHL Number: 1375749. [S243] U.S. Federal Census 1920 U.S. Federal Census, by Ancestry.com, Year: 1920;Census Place: Franklin, Sauk, Wisconsin; Roll: T625_2015; Page: 1B; Enumeration District: 164; Image: 71. [S250] U.S. Federal Census 1930 U.S. Federal Census, by Ancestry.com, Year: 1930; Census Place: Franklin, Sauk, Wisconsin; Roll: 2609; Page: 2B; Enumeration District: 13; Image: 112.0. Herman C. Liegel was born in December 1883 at Wisconsin also reported as Dec 1884. Herman C. Liegel married Victoria Brickl, daughter of Alois Brickl and Justina Bindl, circa 1908. Herman C. Liegel died in 1945. [S244] U.S. Federal Census 1910 U.S. Federal Census, by Ancestry.com, Year: 1910; Census Place: Franklin, Sauk, Wisconsin; Roll: T624_1736; Page: 12B; Enumeration District: 0115; Image: 906; FHL Number: 1375749. [S243] U.S. Federal Census 1920 U.S. Federal Census, by Ancestry.com, Year: 1920;Census Place: Franklin, Sauk, Wisconsin; Roll: T625_2015; Page: 8A; Enumeration District: 164; Image: 84. [S250] U.S. Federal Census 1930 U.S. Federal Census, by Ancestry.com, Year: 1930; Census Place: Franklin, Sauk, Wisconsin; Roll: 2609; Page: 7B; Enumeration District: 13; Image: 122.0. Albert Liegel was born in July 1889 at Wisconsin. Albert Liegel died in 1939. Married Name 30 November 1920 As of 30 November 1920,her married name was Ascherel. Lucinda Liegel was born in September 1893 at Wisconsin. She was the daughter of George Liegel and Ursula Heiser. Lucinda Liegel married Frank Ascherel on 30 November 1920. Lucinda Liegel died in 1957. Name Variation Anton C. Liegel was also known as Anthony. Anton C. Liegel married Anna M. Volk, daughter of Joseph Volk Sr. and Theresa Kirshbaum. Anton C. Liegel was born in October 1898 at Wisconsin. Anton C. Liegel died in November 1977 at age 79. Name Variation Elizabeth Liegel was also known as Sister Mary Adeline Received into the order May 1925 given name Sr. Mary Adeline. Transferred to Baraboo in 1968, remained there until her death. Elizabeth Liegel was born in January 1896 at Wisconsin. Clara Liegel was born on 24 June 1903 at Wisconsin. Clara Liegel died in February 1969 at age 65. Clara Liegel obtained US Social Security Card at Wisconsin; last residence Madison, Dane, Wisconsin. Frank Ascherel married Lucinda Liegel, daughter of George Liegel and Ursula Heiser, on 30 November 1920. John Baptist Liegel was born on 19 August 1826 at Bavaria, Germany, also reported as Aug 1825. He was the son of Peter Liegl and Elizabeth Stoudner. John Baptist Liegel married Barbara Schwartz, daughter of Joseph Schwartz and Elizabeth (? ), in 1851. John Baptist Liegel died on 19 December 1914 at Wisconsin at age 88. John Baptist Liegel and Barbara Schwartz immigrated in 1854. [S245] U.S. Federal Census 1900 U.S. Federal Census, by Ancestry.com, Year: 1900; Census Place: Franklin, Sauk, Wisconsin; Roll: T623_1816; Page: 11A; Enumeration District: 134. [S244] U.S. Federal Census 1910 U.S. Federal Census, by Ancestry.com, Year: 1910; Census Place: Franklin, Sauk, Wisconsin; Roll: T624_1736; Page: 3B; Enumeration District: 0115; Image: 888; FHL Number: 1375749. Married Name 1851 As of 1851,her married name was Liegel. Barbara Schwartz was born on 18 October 1828 at Bavaria, Germany. She was the daughter of Joseph Schwartz and Elizabeth (?). Barbara Schwartz married John Baptist Liegel, son of Peter Liegl and Elizabeth Stoudner, in 1851. Barbara Schwartz died on 20 December 1912 at Wisconsin at age 84 Pioneer Mother Called. Died, at her home in Plain, Sauk county, Wisconsin, December 20th, 1912. Mrs. John B. Liegel, Sr., aged 84 years, two months and two days. Barbara Schwatrz was born October 18th, 1828, at Intergrafenried, Waldmuenchen, Oberpfalz, Bavaria, Germany. In 1853 she was united in marriage with John B. Liegel and this union was blessed with eight children, of whom four have died. In the year 1854, Mr. and Mrs. Liegel left Germany for America and landed at New York. They made their home in that state one year, Mr. Liegel working in a brick yard. The next year, 1855, they left New York, traveling by railway as far as Madison, where the railroad ended, and from there they walked, carrying with them a child one year of age, and numerous articles which they needed on the journey. Arriving in the town of Franklin penniless and homeless, Mrs. Liegel and her husband found employment at George Neuheisel's for about a year, after which they took up a homestead of forty acres, which is now known as the Joseph Bernerel place. Here they at once set to work cutting logs to build themselves a log cabin and here they spent eight years of hard toil and labor preparing the wilderness for cultivation. After having cleared some of the land, they used a grubber in place of a plow, for they did not have the means to purchase machinery, horses or oxen at that time. At the end of eight years they bought a small farm consisting of sixty acres, a part of which was improved, the remainder being wilderness and swamp. At present a portion of this farm is included within the limits of the village of Plain. On this farm they built a frame house which was their home until in 1887 they retired from active work, selling the farm to their son, and reserving a small tract whereon they built the home where she dwelt until our Lord called her to her new home which he had prepared for her in heaven. Mrs. Liegel had been in excellent health for one of her age, having been able to give personal attention to her household duties up to the last, and death came without warning, from pulmonary apoplexy, at 10:45 p. m, she having retired in her usual health. She leaves to mourn her loss her aged husband, two sons, George and John B., two sisters (daughters), Mrs. John Ring and Mrs. Jacob Heiser, and one brother, Joseph Schwatrz, all of Plain, besides thirty-three grandchildren, twenty-two great-grandchildren, and numerous other relatives and a host of friends, all of whom ever remember her moral and Christian life, her love of nature and her love of home and family. The deceased was a kind and loving wife and mother, a true and helpful friend and neighbor, a devoted Christian and a lifelong member of the Roman Catholic church. The funeral services took place at St. Luke's church Monday, where a large concourse of relatives and friends paid their last tribute to her memory, and the interment was made in St. Luke's cemetery. Rev. Father Pesch officiated. Barbara Schwartz and John Baptist Liegel immigrated in 1854. Barbara Schwartz had 7 with 5 living in 1900 children. She had 4 living in 1910 children. Name Variation Augustine Liegel was also known as Gustia. Name Variation Augustine Liegel was also known as Augusta. Name Variation Augustine Liegel was also known as Justina. Married Name 14 June 1870 As of 14 June 1870,her married name was Ring. Augustine Liegel was born in August 1852 at Bavaria, Germany, also reported as 1851. She was the daughter of John Baptist Liegel and Barbara Schwartz. Augustine Liegel married John Ring on 14 June 1870. Augustine Liegel died on 25 June 1928 at Madison, Dane, Wisconsin, at age 75 Mrs. Augusta Ring, 77, died at the home of her daughter, Mrs. Clarence Connelly, 2623 Kendall avenue, Monday night. She is survived by six sons, George, Clemence, John and Lute, all of Madison, Henry, Milwaukee, and Mike, Spring Green; one sister, Mrs. Jacob Heiser, Plain; and two brothers, George and John Leigle, Plain. The body is at the home pending funeral arrangements. Augustine Liegel had 12 with 8 living in 1900 children. [S246] U.S. Federal Census 1880 U.S. Federal Census, by Ancestry.com, Year: 1880; Census Place: Franklin, Sauk, Wisconsin; Roll: 1446; Family History Film: 1255446; Page: 98C; Enumeration District: 251; . [S245] U.S. Federal Census 1900 U.S. Federal Census, by Ancestry.com, Year: 1900; Census Place: Franklin, Sauk, Wisconsin; Roll T623_1816; Page: 3A; Enumeration District: 134. Name Variation Anna Regina Liegel was also known as Regina. Anna Regina Liegel was born on 8 October 1856 at Wisconsin. Anna Regina Liegel died before 1900. Joseph Liegel was born on 5 May 1864. Joseph Liegel died before 1870. Peter Liegl married Elizabeth Stoudner before 1826. Married Name before 1826 As of before 1826,her married name was Liegl. Elizabeth Stoudner married Peter Liegl before 1826. Name Variation John Ring was also known as Johann. John Ring was born on 6 October 1850 at Bavaria, Germany. He married Augustine Liegel, daughter of John Baptist Liegel and Barbara Schwartz, on 14 June 1870. John Ring died on 12 June 1899 at Sauk, Wisconsin, at age 48. Henry Ring was born in March 1887 at Wisconsin. He was the son of John Ring and Augustine Liegel. Theresa Ring was born in March 1890 at Wisconsin. She was the daughter of John Ring and Augustine Liegel. Mike Ring was born in July 1892 at Wisconsin. John Ring was born in September 1894 at Wisconsin. Leona Mathilda Brey died in 1899. She was born in 1899. She was the daughter of George Brey and Theresia Liegel. Paul Liegel died in 1928. He was born in 1928. He was the son of Anton C. Liegel and Anna M. Volk. Name Variation Elizabeth Volk was also known as Lizzie. Married Name 10 April 1907 As of 10 April 1907,her married name was Liegel. Elizabeth Volk was born in 1881 at Wisconsin. She was the daughter of Joseph Volk Sr. and Theresa Kirshbaum. Elizabeth Volk married John H. Liegel, son of George Liegel and Ursula Heiser, on 10 April 1907. Elizabeth Volk died in 1939. Elizabeth Volk had 2 with 2 living in 1910 children.